Marissa and Robert won a $200 Amazon Gift Card in the “Love My Honeyfund” contest. Ria and Wes won $50 when their gift from Kristin was doubled in the “Double the Fund” contest! 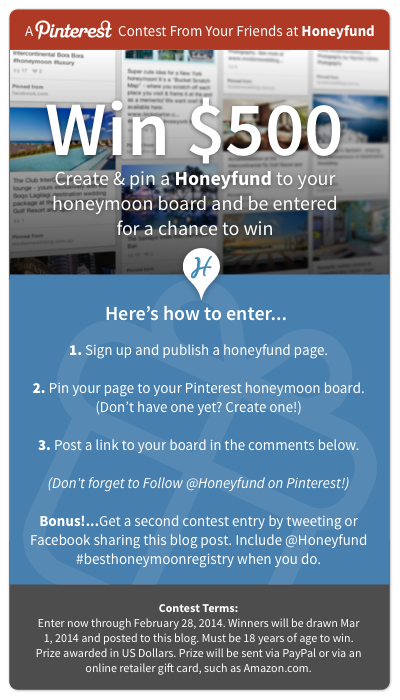 Win $500 for Your Honeymoon! Happy New Year from Honeyfund! This year, we’re especially delighted to welcome our newly engaged brides and grooms — congrats! Doesn’t it feel like this is going to be the best year ever?? We think so, too! To celebrate, we’re offering $500 to one lucky couple!